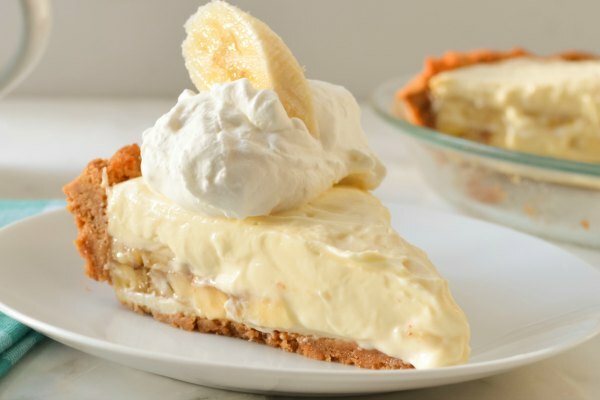 This recipe is sponsored by Safeway and Albertsons. Dinner plans in our house usually sound something like this..
Me: What would you like for dinner? Colt: I don't know, what would you like for dinner? Colt: Hmmm... Barbecue sounds really good, and it's hot. Me: Maybe we should head to pick up a few things, and make a final decision. Colt: That sounds like a plan! 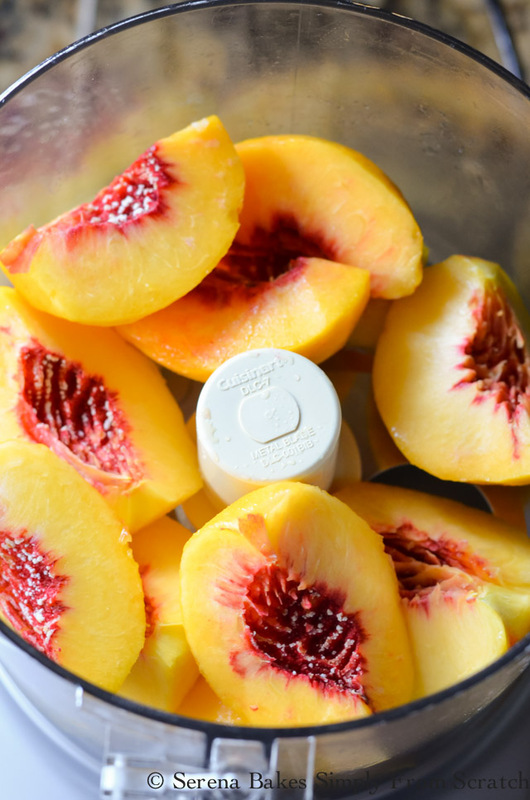 So we headed to Safeway, and found some really ripe O Organics® Peaches as we walked in the entrance that smelled heavenly from almost five feet away, so we knew they were going to be amazing. Colt picked out quite a few, and suggested we throw them on the grill. Then Whiskey Peach BBQ Chicken Breast popped in my head, and Colt agreed that would hit the spot! 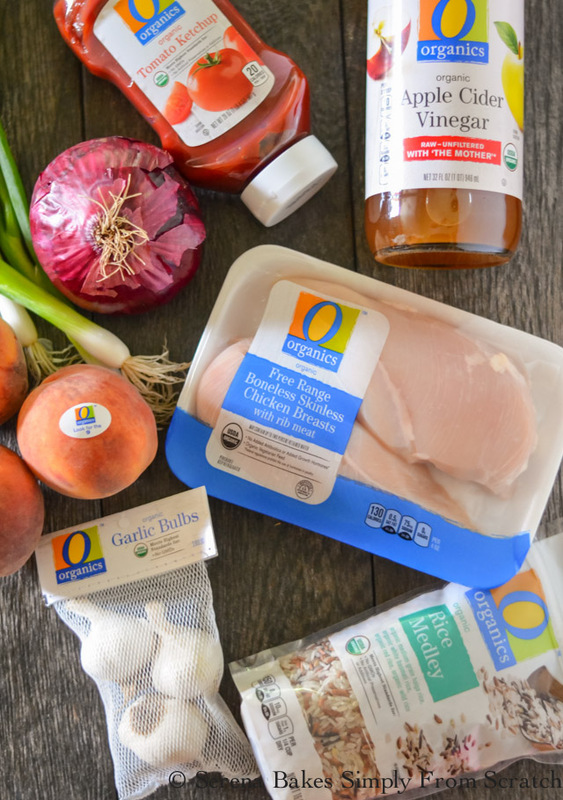 After deciding on Whiskey Peach BBQ Chicken we headed to the meat department, and grabbed O Organics® Chicken Breast. I just love that it's organic, free range, affordable, and the chicken is always fresh with great flavor. The O Organics® line is exclusive to Safeway and Albertsons stores. It offers USDA certified organic chicken, and beef, which is the perfect base for a variety of meals, especially simple weeknight dinners. We also grabbed a few other essentials to make the Whiskey Peach BBQ Sauce, and O Organics Rice Medley for a side. I purchase all my O Organics from my local Safeway, and Albertsons, but you can find them at all Albertsons family of grocery stores, including ACME Markets, Jewel-Osco, Vons, Pavilions, Tom Thumb, Randalls, Shaw's, Star Market, United Express, and Carrs/Safeway. 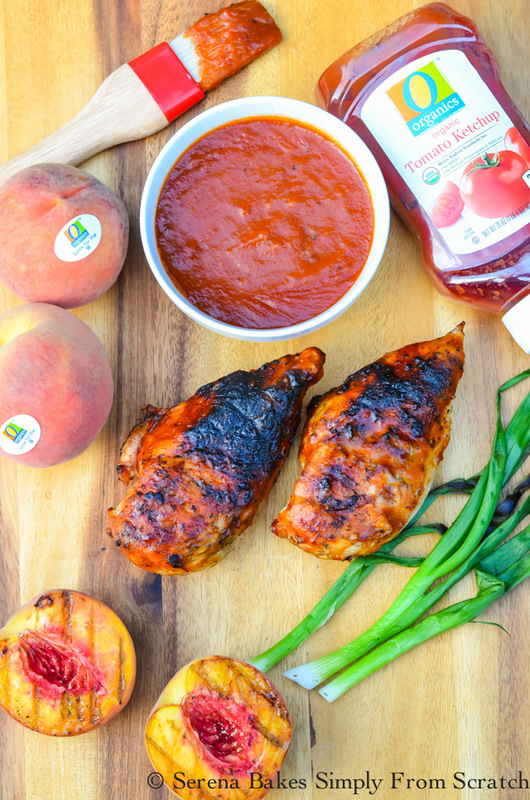 Are you ready to make Whiskey Peach BBQ Chicken? 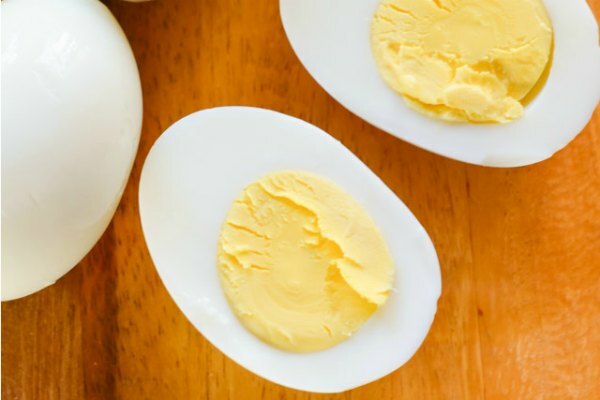 In a medium sized pan add 1 tablespoon Olive Oil, and 1/2 a Onion finely diced. 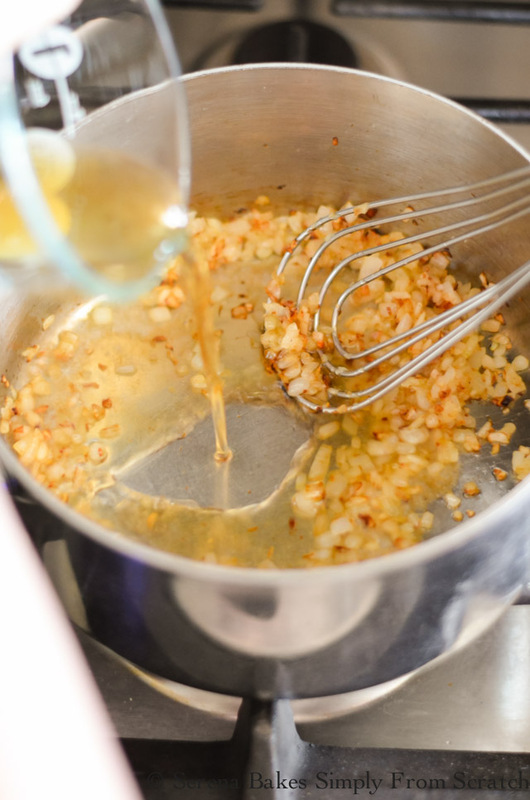 Cook until onion starts to caramelize, and stir in 1 clove Minced Garlic. Stir until garlic starts to soften, and add 1/3 cup of your favorite Whiskey. Cook for 1 1/2 minutes until alcohol dissipates. 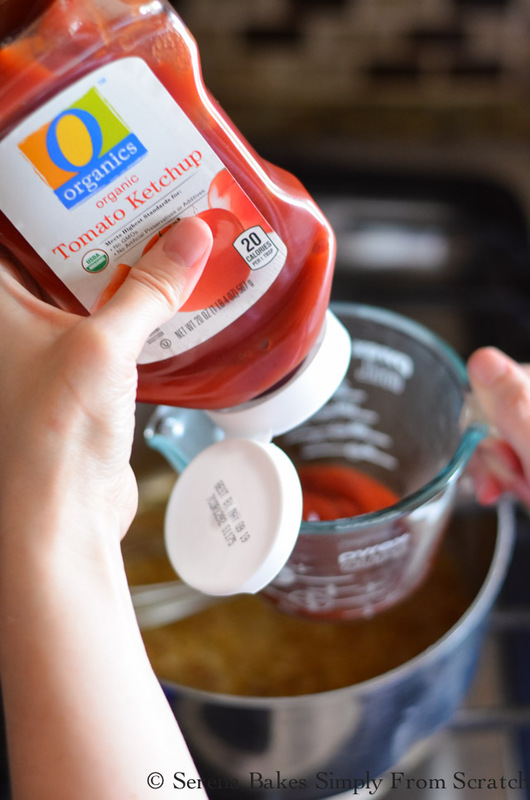 Stir in 1 cup O Organics Ketchup. 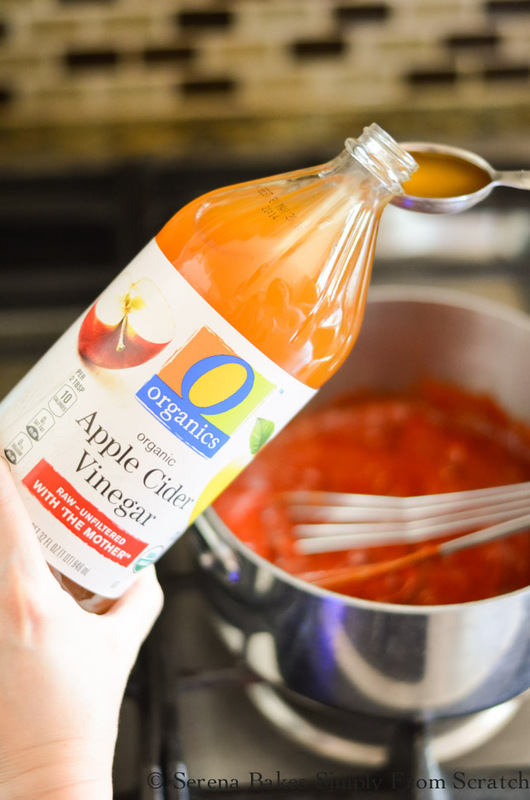 Add 1 tablespoon Apple Cider Vinegar. 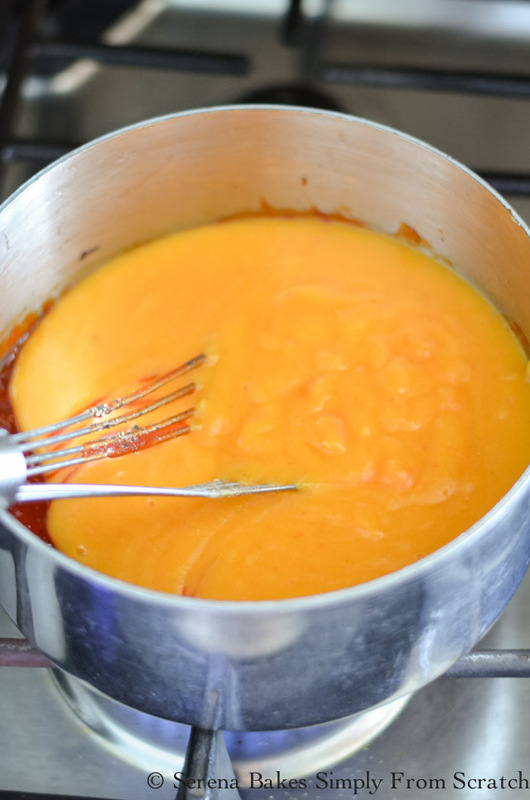 Puree 3 large O Organics Ripe Peaches, peeled and seeded, until smooth. Add peach puree, 2 tablespoons Brown Sugar, 1 whole Diced Chipotle Pepper in Adobo Sauce, 1 tablespoon Adobo Sauce, 1 tablespoon Worcestershire Sauce, 1 teaspoon Smoked Paprika, 3/4 teaspoon Salt, 1/2 teaspoon Pepper, and 1/2 teaspoon Granulated Garlic. Stir until well combined, bring to a simmer, and reduce heat to low. Cook for 20 minutes over low heat while heating grill, to cook chicken breast. Season O Organics Chicken Breast with your favorite Seasoning Salt. Cook over medium grill heat for 5-6 minutes per side on a greased grill. 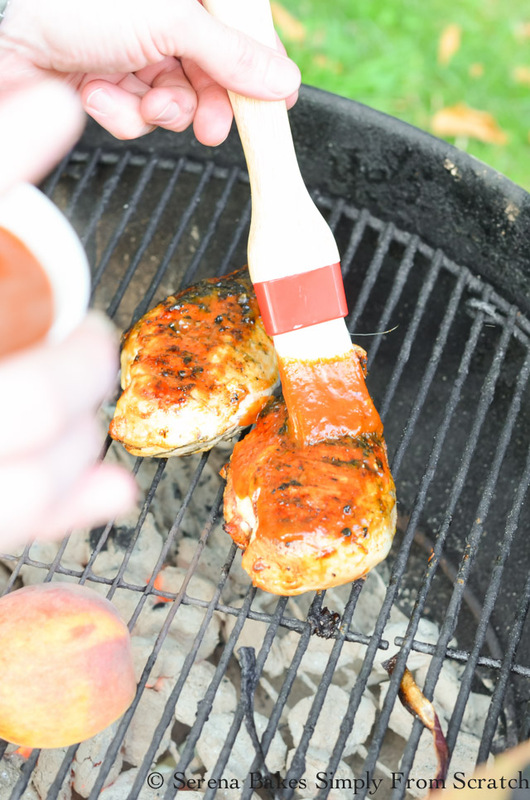 Brush generously with Whiskey Peach BBQ Sauce, and cook an additional 2-3 minutes per side until chicken reaches 165º degrees F.
If desired cut peaches, sliced onions, and green onions can be brushed with oil, sprinkled with salt, and added to the grill the last 5-8 minutes of cooking until softened, and caramelized. Serve with additional Whiskey Peach BBQ Sauce, and O Organics Rice Medley cooked according to package, if desired. By far one of my top favorite summertime BBQ meals! Visit Albertsons to find a store near you to discover more easy meal prep tips, and ideas. Whiskey Peach BBQ Chicken is a grilling must make! In a medium-sized saucepan over medium-high heat add olive oil, and onion. Cook until onion is caramelized, and add garlic. Stir until garlic is softened. Deglaze pan with whiskey, and cook for 1 1/2 minutes until alcohol dissipates. Stir in remaining ingredients until well combined. 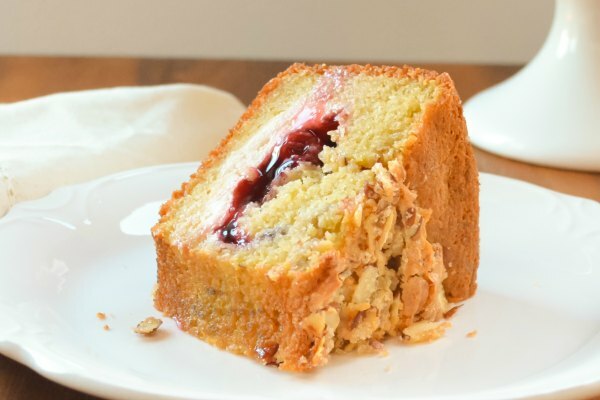 Bring to a simmer, reduce heat to low, and cook for 20 minutes. Heat grill until medium hot. Sprinkle chicken breast with seasoning salt. Cook chicken for 5-6 minutes per side on greased grill. 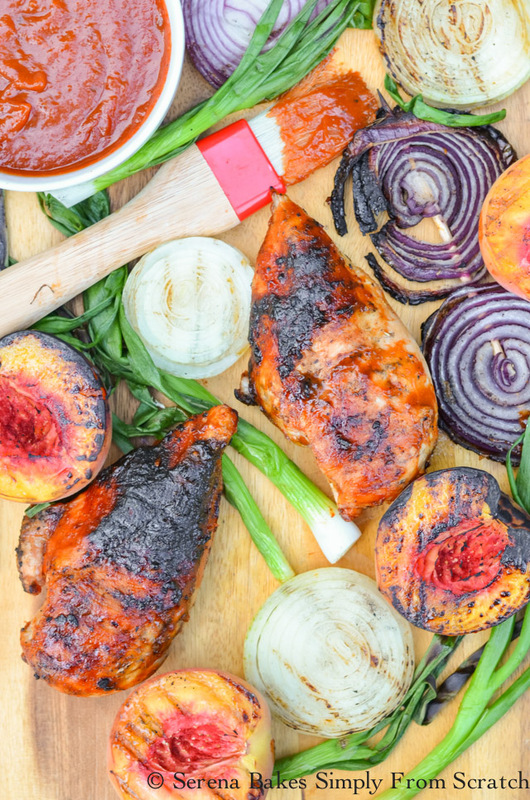 Brush generously with Whiskey Peach BBQ Sauce, and cook an additional 2-3 minutes per side, until internal temperature reaches 165º degrees F.
Brush peaches, and vegetables, with cooking oil. Sprinkle with salt. Add to grill the last 5-8 minutes of cooking. Cook until softened, and caramelized. Serve with cooked rice, grilled peaches, grilled vegetables, and additional Whiskey Peach BBQ Sauce.